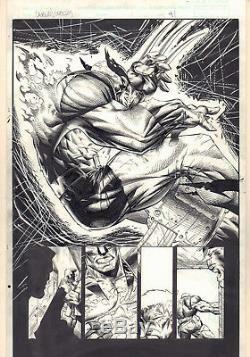 Wolverine / Cable #1 p. Wolverine Action Splash - 1999 pencils by Stephen Platt and inks by Scott Koblish. This item was uploaded by Bobby. If you have any specific questions or requests, please ask us prior to ordering and we'll get back to you as soon as we can. If there are any problems with your order whatsoever, please message us before leaving feedback and we'll be happy to work with you to fix the situation! The price may vary based on size, weight, and location. When are your operation hours? We are not open on weekends, so if you send us a request on Friday evening we won't get back to you until Monday afternoon. Please don't take it as us ignoring you! We will work on your request Monday and get back to you as soon as we can. Also, if you order from us on a Friday evening or Saturday morning we won't start processing your order until we open on Monday. The tracking hasn't moved. We realize you're eager to get your item, so if the tracking hasn't moved in a few days please don't be concerned. There are times when the tracking won't even show movement until it's in your area's regional distribution center. This is normal in our experience. The image pictured is one of a kind original artwork unless otherwise described. Can you issue a COA? Please make sure you leave us a note while checking out and shoot us a message immediately after requesting one, just to be sure. If it looks unusually high to you please send us a message and we'll be happy to double check for you. Such as: several comics can fit in one cardboard mailer, as can more than one record. Multiple art pages can easily be combined because they are light and thin. For instance, two statues require a much bigger box. Same goes for CGCs, as the package gets bigger and heavier as you go. I've had some bad experiences.. You needn't worry; we are professionals who value your business and want your item to arrive safely as much as you do. I have been collecting for over 30 years. I send out items the way I would like to receive them. This is normal for our Post Office and will not impact you receiving your item in a timely matter. Have these CGCs had any previous owners? Pictured left to right, my employees: Chris, Connelly, Bobby, & Shannon alongside my family: Sharon, Myself (Anthony), Cameron, AJ, and Jamison Snyder. The item "Wolverine / Cable #1 p. 41 Action Splash 1999 art by Stephen Platt" is in sale since Thursday, July 12, 2018. This item is in the category "Collectibles\Comics\Original Comic Art\Splash Pages". The seller is "anthonyscomicbookart-online" and is located in Moonachie, New Jersey.